Have you ever gotten your kids ready for a photo session, just for it to end up in disaster? Crying kids, no smiles, and frustration? Photo sessions don’t always go as planned, and a lot of times end up with rattled nerves, stress and dissappointment that you didn’t get the photos your were hoping for. 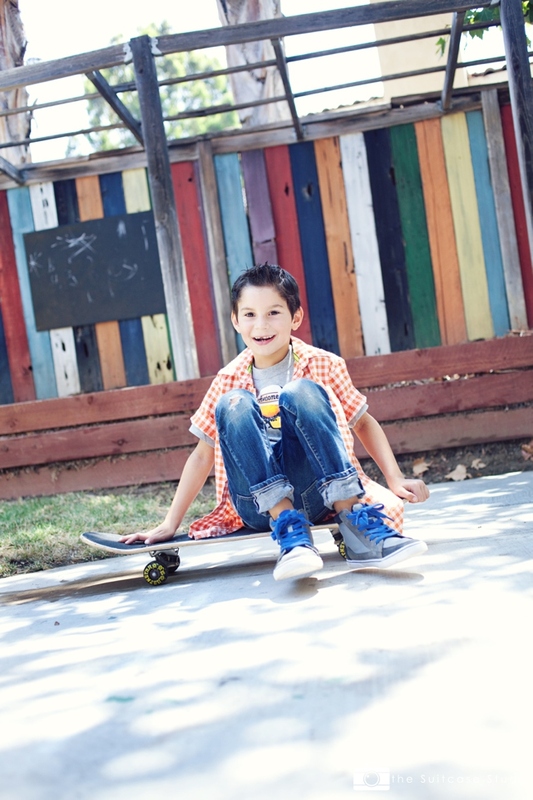 Being a mom of boys and having gone through lots and lots of photo shoots with them, I know all this too well. Did you know that there are ways for making photo sessions less stressful all while still getting great results in the pictures of your kiddies. I experienced this during my photo shoot with Michelle Carrillo of The Suitcase Studio. She has a magical way with kids. She was able to capture a side of my boys that I can rarely get on film. After talking with Michelle, I found out a little bit about her goals as a photographer. She is on a mission to make taking pictures FUN again. She loves Instagramming a million + one pics of her doxie, and believes that JOY can be found every day. Want to play along? 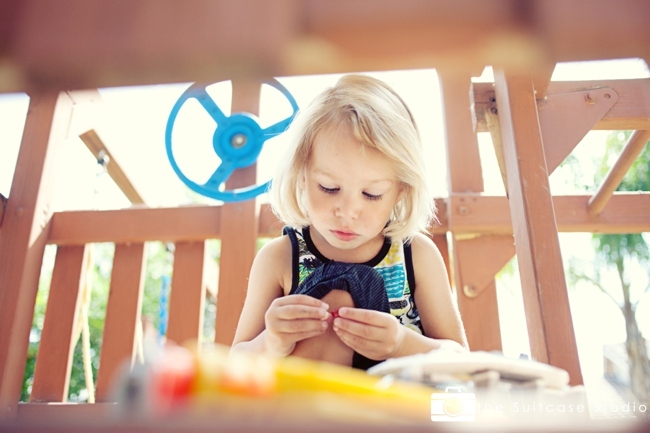 Be sure to check out her all-new “Portrait Parties.” She truly has a gift with children, and offered to write and share some tips that she has learned during her career as a professional photographer. A lot of times, boys have A LOT of energy. 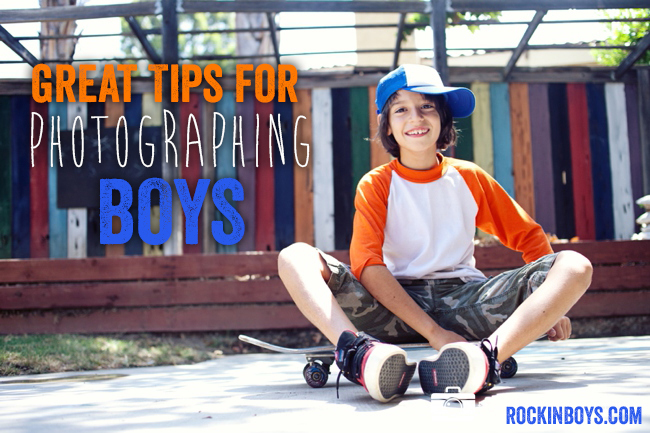 Michelle has written some tips below, on how to get those special photographs of our boys. She really knows her stuff! “It’s been said that a boy is “a noise with dirt on it.” If you’re a mom of a boy, I’m guessing you know this to be true. And the times you’ve attempted to capture your little guy on camera, the photo is probably all-too-often a motion blur that more closely resembles a fabled Bigfoot sighting than the kid you know and love. But ask him to stand still and smile, and you let loose a grumbling gremlin. Sigh. 1. Plan ahead. To minimize facing a possible case of the “grumpies,” give your kids plenty of heads up that you plan on taking photos of them on a certain date/time. 2. Collaborate. Treat it like a FUN activity and ask your kids for their participation. No begging or bribing allowed. 3. Be Flexible. Go in with a concept of what you’d like to capture, instead of a concrete plan. Sometimes the best photos captured are the ones you never planned for. 4. Have FUN. Smile, laugh and don’t forget to PLAY. 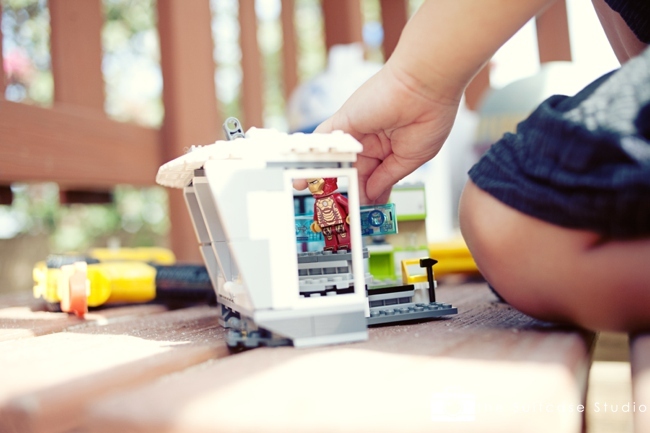 You’re not just capturing photos… you’re making memories. Ask him to show you some of the things he’s into right now. 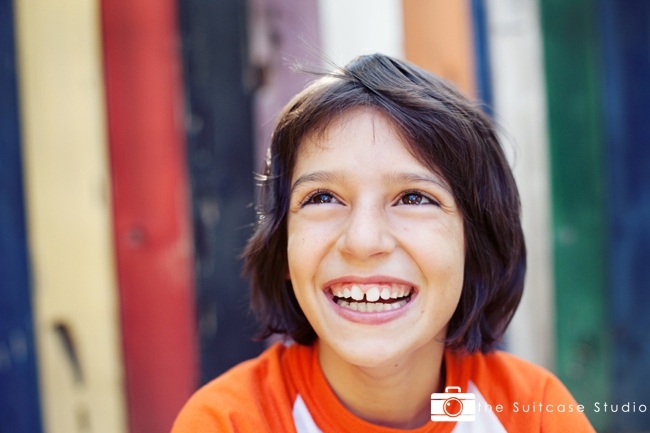 Most kids are more than happy to show off their favorite toys and games, their eyes lighting up with joy (which makes for a super-easy way to capture real smiles). When he’s through talking, just back up a bit and watch him play. And really observe. You’ll then be able to get some fabulous lifestyle photos to document his life in this moment. Most kids develop a “fake smile” around age two. This is the smile they usually break out whenever they see a camera pointed in their direction (and why I think “cheese” should be a 4-letter-word). Along with the fake smile comes the stiff stance, too. Your mission is to bust through the cheese-factor and capture the real deal. It CAN be done, and it’s actually quite simple. Here’s the trick: give them something to DO. Little boys don’t hold still for very long, so simply let them MOVE. And then compliment them along the way for doing such a great job. 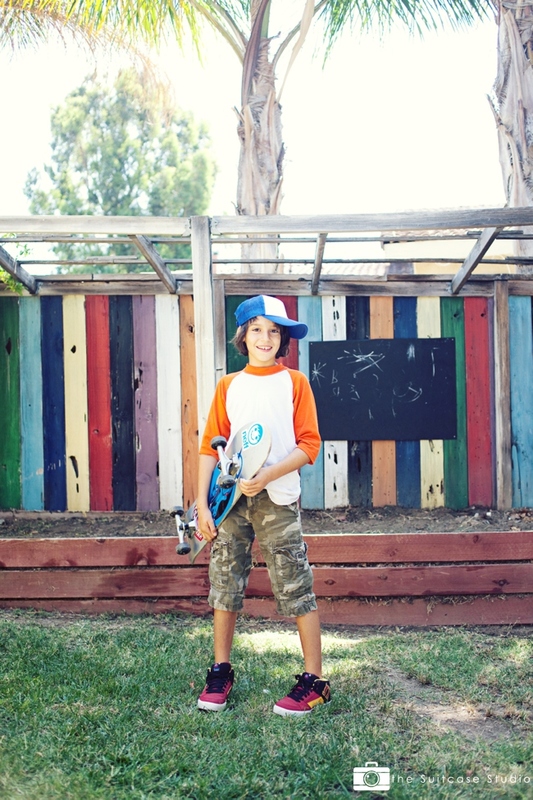 For instance, Jackson posed for me while holding his skateboard, but it was still a bit stiff. So I simply asked him to spin in a circle aaaaaand… STOP. His body suddenly relaxed and he started laughing, which let me capture his fantastic smile. 3. Ready for my close-up. 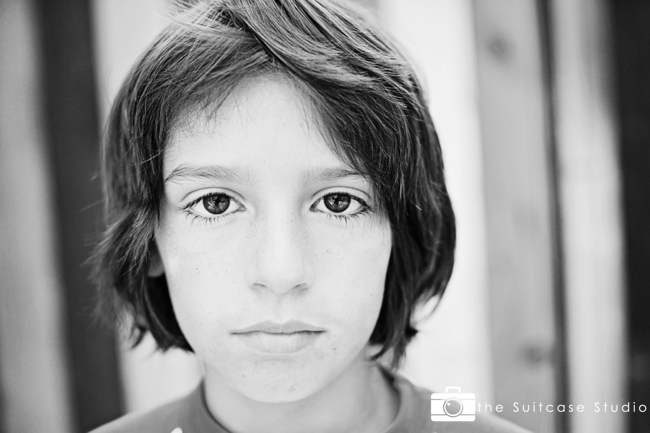 For fabulous close-up images, I like to use what I refer to as “the art of the informal interview.” Just step a bit closer and ask your son a series of questions while you take pictures of him. The questions can be whatever you come up with… from the simple “what’s your favorite color today,” to the thought-provoking “what superpower would you LOVE to have,” to the funny “would you rather kiss your sister or a fish,” or even the serious “what’s a favorite memory of yours?” What will happen is that your kiddo will reveal a bit more about his REAL self, through words AND body language. Because even if he says “I don’t know” over and over again, you can still witness something fabulous. Does he look up to the left or stick out his tongue a tad as he ponders an answer? Does he get shy and look down a bit? Or does he suddenly crack up with full-body laughter at something he finds hilarious? All those quirks of his are what make him absolutely unique, and make fabulous portraits… even if it means he’s not staring straight into the camera. And if you’d like to capture a more serious expression, try THIS out: make sure the giggles are out of his system and he’s a bit more calm. Start by asking him to close his eyes and relax his face. Then ask him to take a deep breath and let it out. Finally, tell him to open his eyes and look at you. Ta-da… eyes so clear you’ll be able to see straight to his soul. We all know that the best-laid plans don’t always come to fruition. This is why I recommend going in with an idea of what you’d like, but not being too rigid about it. Because once it gets to be stressful, on your part or his, the FUN is gone and the stress is what you’ll remember when you look at the resulting pictures. Being a bit flexible with what you’re after will give you a much greater chance at getting great photos. And remember… if things aren’t working out today, you can always try again tomorrow. This happens to the best of us. 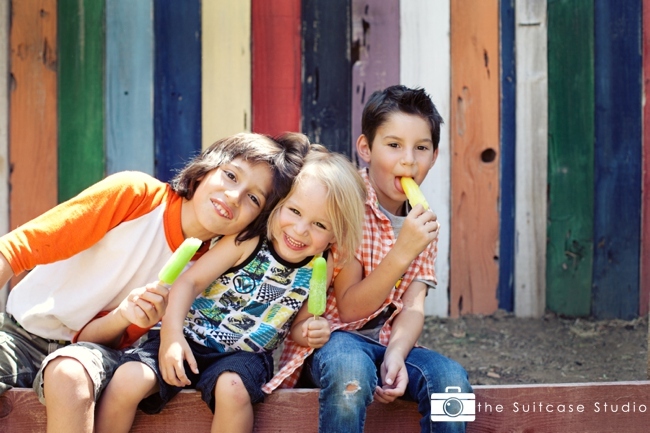 I’d wanted to capture close-up portraits of each of the 3 boys in front of the fabulous colorful fence. But 3-year old Vann wasn’t having any part of it. He didn’t WANT to sit over there. If I’d forced him to do so, I would have ended up with a tantrum in 30-seconds flat. Instead, I tried a different approach. Keeping my main goal in mind (getting close-ups), I ditched my previous plan (painted fence background) and followed him for a few minutes to figure out what that approach might be. Vann was intent on sitting at the patio table and reading a Lego book. So I simply let him do just that. I let him get calm and settled into his spot, then swiveled his chair to face me (while telling him I would be doing so), and asked his mom to hold the book up near my lens. He was relaxed and happy, and I captured his gorgeous smile and even his teeny-tiny toes. Score! He was happy, I was happy, and there was no meltdown in the process. 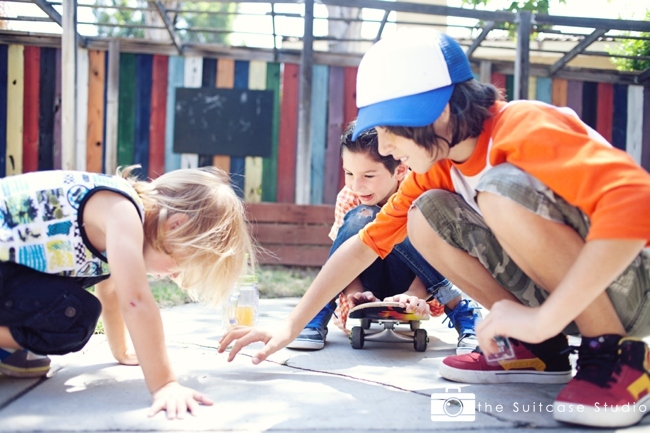 Thank you Michelle for such fabulous tips on how to photograph children…namely high-energy little boys! You are such a talent. We wish you all the best Michelle in the New Year! If you would like to check out more of Michelle’s portfolio and/or book an appointment with her, head over to The Suitcase Studio website. 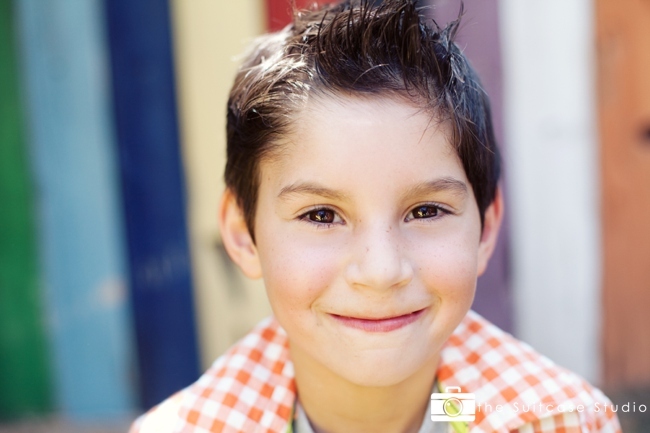 She offers full-service photography sessions as well as mini-portrait sessions and portrait parties! And she has just opened her very own studio…which we are very proud of her for this accomplishment. Jill, this is one of my FAVORITE posts of yours! I don’t have a boy, rather a very GIRLY girl, but I can definitely use these tips. Thanks!!! I’m going to use every single one of these tips for my pictures from now on. Super great tips! These photos are amazing!! And the tips are perfect! LOVED this post Jill!